Stephanie French-Mischo's short fiction has appeared in Issue 7 of Apeiron Review (September 2014), Still Point Arts Quarterly (September 2012), Issue 6 of Midwestern Gothic (July 2012), and in Beginnings Magazine (Winter 2005). In 2010, she was a finalist for the Santa Fe Literary Awards and invited to read at Indiana University-Purdue University Indianapolis' International Women's Day Celebration, part of the Rufus and Louise Reiburg Reading Series. 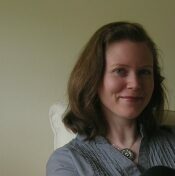 She earned an Honorable Mention in Glimmer Train Stories' 2009 Short Story Award for New Writers and is at work on a novel. Steph holds a Bachelor's in General Biology and a Master's in Microbiology, both from the University of Illinois at Urbana-Champaign. She lives in Indianapolis with her husband of sixteen years and is a member of the Indiana Writers Center.